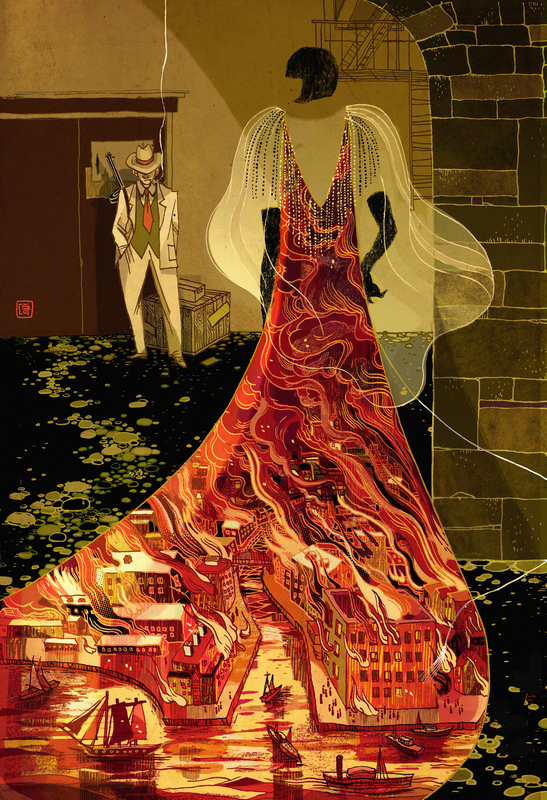 Victo Ngai is a NY based illustrator from Hong Kong, who graduated from Rhode Island School of Design. Victo creates art for newspaper and magazines such as the New York Times and the New Yorker; makes books for publishers such as the Folio Society, Abrams and Tor Forge; and works on advertisement campaigns with companies like the McDonald’s, IMAX, MTA Art for Transit (New York subway), Lufthansa Airline and General Electric. 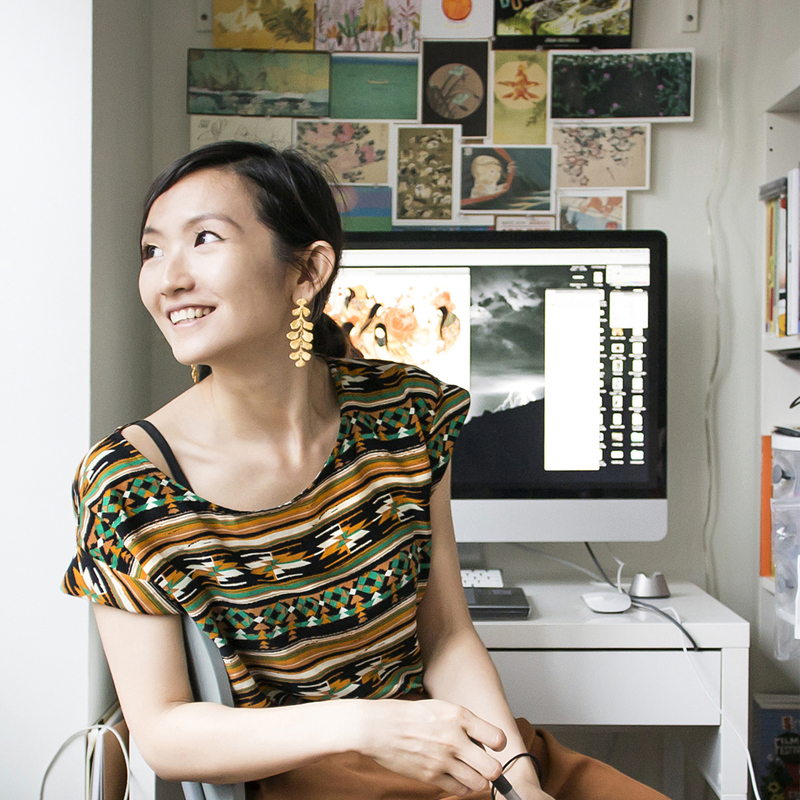 She is a Forbes Under 30 (Art and Style) honoree and Society of Illustrators NY Gold Medalist. Recently Modelo had the opportunity to meet with Victo and learn about her philosophy and unique illustrations. I’ve been working full-time as an illustrator for five years. I started working back when I was in school, if you count that it would be around seven years. I’ve been drawing for as long as I can remember. I was an only child and my parents used to be very busy. For my generation, we didn’t have the Internet or these other electronic toys. My family at that time was pretty modest, so I was left to my own devices to entertain myself. I found copy paper and pens that were lying around and I just started drawing. At some point I started creating creatures and imaginary friends on paper. We would just have fun adventures on paper. It just turned into this elaborate fantasy world and that’s how I got into illustration. Illustration essentially is about using visuals to tell a story and creating a world that you’re able to bring people into and get lost in. I realized I could do drawing as a living some time in high school. For a while I thought of drawing as just a hobby. In Hong Kong, the arts is not something that’s considered a normal career path to pursue. It doesn’t seem like an option. Somehow I was so sick of doing all the training for the proper exam, I wanted to make something creative and draw something. It dawned on me: how nice would it be if I could do what I love and I could make a living out of it? After that I started researching on the best art schools around the world, since there’s not many options in Hong Kong. One of my friend’s friends studied art at Yale, so I asked her what school she would recommend. She said RISD (Rhode Island School of Design), so that was the only one I applied to. I figured it’s expensive, and if I can’t get in I might as well just follow the normal path and go to Hong Kong University and become a lawyer. The high school I went to was more for the advanced students, teachers and parents expect great things from you — and by great things I mean things that can be measured and quantified with money and social status, lots of doctors, bankers, and lawyers. I was the black sheep in that sense. In terms of visual influences, there’s a lot of them. People, or artists, who are dead mostly. My RISD portfolio teacher Chris Baselli during junior year made me realize the reason that I went into RISD was because I love what I do. That’s the way to find my own style and my own voice. I didn’t have formal art training before RISD. Going into it was pretty overwhelming. There were new skills to learn and new artists that I had never heard of before — but that you’re supposed to know because they’re big names. I got lost a little bit, trying different things and seeing different things that I like, and then trying to mimic those. I love it so much, so I thought maybe that’s what I wanted to do. Chris is the one person that made me realize that your own style is something you have to search for within, and not search outside. That was a great turning point for me. After that I established the body of work that I had. I had a fairly consistent portfolio when I graduated and my career took off quite fast after graduation. Everywhere. First of all, illustration is different than fine art, it’s different from gallery art. We usually don’t just sit there and dream up something we want to paint or something we want to express. Usually, you’re given a prompt. I am very interested in concepts with every project. I start with learning what my clients want me to communicate: what is the most important thing that I need to showcase in this piece? From then on I brainstorm and see what kind of visuals will be relevant and will be the best symbolism or metaphor to communicate this idea and tell this story. I get the assignment, I read it over a lot of times. I try to boil it down to the essence — usually a few phrases or short sentences. After understanding what the assignment is about I like to have some distance from it. I realize a lot of the time that the best idea comes when you’re not thinking too hard. When you think about it, the imagery that comes to mind becomes very literal. You’re almost boxed-in. I like to understand something and then forget about it for a while. Usually when it’s least expected something will pop into mind. It could be something abstract or not related, but somehow the feeling matches with the assignment and then I will start to explore how I can tie this back in. After the concept is done, I usually supply my clients with at least 3 sketches of options. When one is approved I take it to find out if any tweaks are needed for the sketches and then I will do the line work and all the texture on paper, with pen and ink or various mediums. Everything is brought into photoshop and colored digitally. The thing is that I draw the way I draw because I don’t know how to draw any other way. I don’t think it’s something for me to be very objective to say, but I have gotten feedback from past clients. They like my work because they think it solves the problem quite nicely without feeling like the piece is so editorial. They like that it fulfills the commission — the purpose of it — but they would still like the piece to hang in their living room to stand alone as an art object. I would say all of them because that’s just what I try to do. There are times with certain — more literal — clients if it’s about financial matters then they want a business person holding a briefcase with a money sign. That’s something that solves the problem but it’s almost too easy. It’s not a smart idea — it’s not something that you have to think over and it’s definitely not something that you’d like to frame as an art piece. There are times that if you sign a contract without knowing this is the kind of client, I just end up not working with them anymore because we’re not a good fit. After a few years of working, the clients that keep coming back to me and the clients that I love working with are the people who understand my way of working. The pieces that I created all represent my unique approach. I’ve been doing a lot more cross-disciplinary work and it’s been fun. I’m hoping to do more of that. I personally have a great interest in fashion so I’m hoping there’s some kind of collaboration with fashion houses. It could be a window display, it could be a photoshoot, or it could be the pattern on the fabrics. That could be exciting. A great drawer doesn’t make a good illustrator. A great painter also doesn’t make a good illustrator. A great thinker doesn’t make a good illustrator. Being a great illustrator means you have to have the best of both worlds: you’re able to deliver an idea but you’re also able to execute it. If you have the concept, but you don’t have the skills then people won’t know what the concept is about. It’s almost like having a software without the hardware to deliver it. You have to be able to think in a critical way and also an imaginative way, and you have the skillset to represent that. I hope it will still be the same. I hope I will still be as excited. Right now I’m still at the early stage of my career and one of the biggest fears that I have is losing the excitement. After a while all the goals that you have, have been achieved or the dream client has been fulfilled. The motivation really has to come from within. I hope that drive doesn’t die out in 10–20 years. The way to maintain that is to keep evolving, keep making new stuff — whether it’s coming up with ideas and concepts or improving my artistic skills. Maybe in five years I’ll look back at the portfolio that I have right now and that will be something that I’m ashamed of because then it means that I’ve come a long way. This is a phrase that has become my motto at the moment, which I didn’t know when I first started — “it’s not about how good you are, but about how good you want to be,” by Paul Arden. When you were a student you follow rules, you follow assignments which are necessary for the classroom environment. It also puts you in the mentality of being a follower or doing things that are required of you, instead of being self-generated. When I was in school and I had the chance of doing an internship, I would pick the internship that on paper says you will be more hands-on and will give you a lot of tasks to try on. As opposed to work that might give me better networking connections. I had the option to interview with the New Yorker or to intern at the local Providence small ad agency. I picked the latter one because I thought that I would learn more. Now knowing what I know now, I think I would benefit more from going to the New Yorker because even though on paper you’re just doing the minimal stuff, it’s up to you how much you want to learn. You can just look around the office: you can study how they run the day-to-day life and how they run the projects. You can learn what requirements they’re looking for for the people they hire. I imagine within the office they would talk about if the project is not up to par. Its problematic and there’s so much you can learn just from observation if you keep your eyes and ears open. After working for a few years I realized that sometimes even if a project scope is given to you, it’s limited, you can find opportunities to pitch more ideas to the client during the process. There are times when my client just wanted one piece of work from me and I sent him three different idea sketches; it turned out that he loved all three of them — the project became triple the size. That’s something I didn’t know: you don’t have to play by the rules. A lot of the time you can set the rules by yourself. We as humans function better with rules, which is why I love illustration. You’re given the specs or you’re given the things you need to communicate. It reminds me of the movie 1900 about a pianist born on a cruise ship. He had the opportunity to get off the ship and go on land to visit New Orleans because everyone said this is the best town for pianists. After thinking over and over he decided he would still stay on the ship because he can only play piano when there’s a limited amount of keys. The world outside is like a piano with an unlimited set of keys and that doesn’t make music. And that’s like illustration. With rules, you actually become more creative. It’s almost like if I give you an entire warehouse full of tools, as opposed to only giving you one pencil, one scissor, and one piece of paper. Chances are you’re going to give me something more interesting with the limited tools because you’re not relying on the exterior — you have to rely on what’s inside to make the project happen.